Nearly 10,000 plumbers attended the Mahotsav by IPSC. 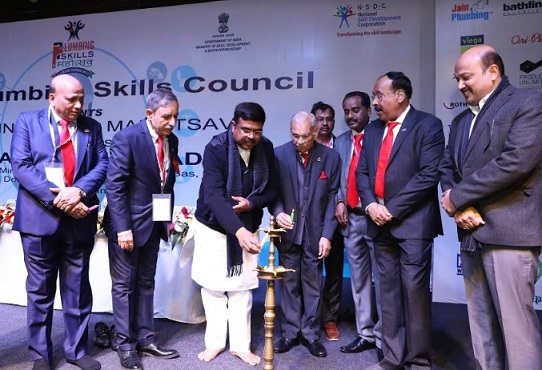 The apex skilling body of the Indian Plumbing Industry, IPSC (Indian Plumbing Skills Council) organized the mega event, “Plumbing Skills Mahotsav” which was inaugurated by Shri Dharmendra Pradhan, Hon’ble Minister of Skill Development & Entrepreneurship at Thyagraj Stadium, New Delhi. 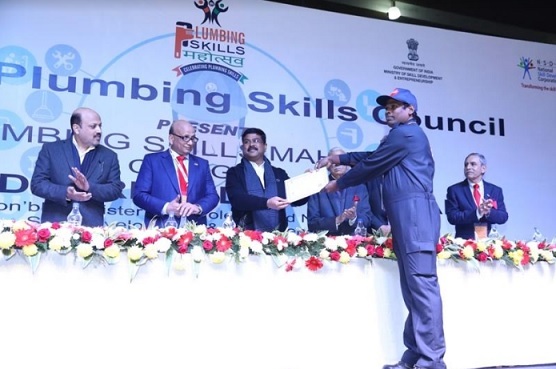 The day long event was attended by almost 10,000 plumbers from all parts of North India who were trained in the latest plumbing techniques and were also handed out participation certificates. Many who have already undergone skill training and assessment are also being felicitated with the IPSC-Skill India Certification. One of the biggest highlight of the event was the launch of Plumber Konnect – World’s 1st Mobile App which aims to bring certified plumbers closer to its users. Plumbing Skills Mahotsav also witnessed the best plumbers being handpicked for International and Domestic placements by the companies as a part of the Job Fair. Other excitement at the mega event includes Lucky Draw including Motorcycles, TVs, Tool Kits, and Prizes etc. “With majority of the plumbing industry workforce in India informally trained, it is imperative for us to incorporate technological interventions to expand the horizon of skill training across our plumbing workforce to match with the global standards,” further added Pradhan. He also appealed the plumbing community to avail loan facility under MUDRA Yojana and walk on the path of self-employment and evolve from being job seekers to job creators. On the occasion, Minister Shri Dharmendra Pradhan also handed over awards to distinguished people in the plumbing community and certificates to skilled candidates in plumbing. “Plumbing is a technical skill having a vast range of application across all the sectors of Economy – Agricultural, Manufacturing, Industrial, Construction and Domestic. Latest plumbing techniques can go a long way in maintaining public health and realizing environment-related goals such as effective water management and its conservation,” added the Prime Minister. Plumbing Skills Mahotsav by IPSC under the aegis of NSDC (National Skill Development Corporation) marked the presence of distinguished dignitaries and industrialists including Dr. Manish Kumar, MD & CEO, NSDC, Dr. R. K. Somany, Chairman IPSC, Mr. Vinay Gupta, Vice-chairman IPSC; Mr. Rajesh Agarwal, Joint Secy & CVO Ministry of Skill Development & Entrepreneurship and Mr. Gurmit Singh Arora (IPA Chairman), Heads of State Skill Missions. Plumbing Skills Mahotsav is a part of the larger ecosystem IPSC has envisaged and the launch of Mobile App, Plumber Konnect shall act as a catalyst in the perfect marriage of bringing technology and skills together to benefit the end consumer. Plumber Konnect is an innovative app, where the user will get best service from a trained and certified plumber and genuine parts in minimum time on pre approved costs. The app has also been seamlessly integrated to payment gateways. “Overseas employment for the plumbing workforce is yet another area in which IPSC has also been particularly active and has also been largely successful. IPSC has also been trying to get notification issued by several agencies (private and public) so that the trained and certified plumbers are gainfully employed,” added Mr. Gupta. Plumbing Skills Mahotsav also showcased range of advanced products, educational seminar and Job placement workshops by the international & domestic brand like Hindware, Bathline, NSF, Watertec, Viega, Jain Plumbing, Acquaviva, Rothenberger, Kitec, Parryware, and Xylem etc.